This is a fairly basic post but it happens enough that I’d like to call out the basics of troubleshooting it. I’ve seen many cases over time where mail flow is either being halted or become sluggish due to a third-party transport agent (I actually saw 3 instances of this happening this past month which prompted this post). Examples of Transport Agents could be Anti-Virus software, Anti-Spam software, DLP software, agents which add disclaimers to email messages, or email archiving solutions. I won’t call out specific vendors as I don’t think there’s necessarily anything wrong with any particular one. Sometimes an install of a piece of software just becomes corrupted or there’s some unforeseen incompatibility between the third-party software & Exchange; or some other software in the environment. However, sometimes the Agent can indeed have a bug which needs to be addressed with the vendor. To highlight more recent examples, last week I had a colleague come to me saying he had two Exchange 2010 Hub/CAS boxes, with the same config, yet one of them would have a slower connection when he would telnet to it; the banner would take at least 20 seconds to be displayed. This also resulted in the health checks for the hardware load balancer in place to mark the server as down. Each server had the same Anti-V/Anti-SPAM software installed, yet only one was showing the symptoms. For testing purposes he “disabled” the third-party software using its management interface but the issue persisted. However, after running a “Get-TransportAgent” on the server, the Transport Agent still showed as being “Enabled”. This demonstrates a point I frequently make with customers, that disabling Anti-Virus software rarely serves as a useful troubleshooting step (even file-based Anti-V). This is because the TransportAgent is typically still enabled. For file-based Anti-Virus, even with the Services disabled there is usually still a network filter driver that is sitting on the TCP/IP stack which could be causing issues (only an uninstall of the 3rd-party product removes it). Bottom-line, an uninstall is still the best method to remove potentially problematic Anti-V/Anti-SPAM/Anti-Malware software. So in this case the issue was a bad/corrupted install of the product on that server. Another scenario (also Exchange 2010) was where messages were stuck in the Submission Queue for extended periods of time. 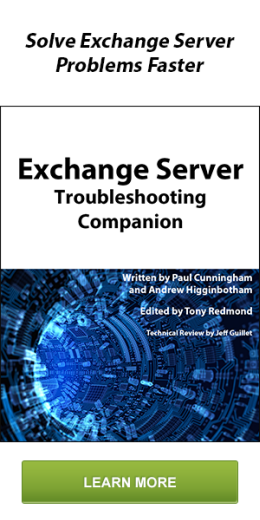 The Application Logs were filled with Event 1050 MSExchange Extensibility events which were stating the installed agent was taking an unusual amount of time to process an event; thus causing the delay in transport (Reference 1 2 3). After running Get-TransportAgent I was actually greeted by an error message saying it was unable to access a file located in the “C:\Program Files\Microsoft\Exchange Server\V14\TransportRoles\agents” directory. This is where the files associated with your Transport Agents are stored. So again, the issue was a corrupted install of the product. Reinstalling the software resolved the issue. So nothing fancy about this one. Just check Event Viewer for Transport events or use process of elimination if you’re experiencing any of the symptoms above. Having worked with Microsoft Support many times in the past, they will almost always ask you to remove third-party components such as Anti-V if they are unable to pinpoint the issue to its source; so save yourself some time & rule it out first.